In a reserves 2002-03 pre-season friendly at Bamber Bridge, Michael Symes scored for the reserves almost immediately after coming off the bench. After all the fuss about Wayne Rooney and before that about Nick Chadwick, he was Everton's other striker prospect poised to take another step up into the Reserves. Michael Symes spent the next two seasons trying to establish himself in the reserve team squad and it was a salutatory lesson to see how his development was bedeviled by injuries. The boy had everything to be an outstanding No 9 for Everton. He was quick, tall, athletic, skilful, bags of presence and extremely good in the air. He was a hard-worker who chased down defenders and is somebody who brought other players into the game (just like Sharpie used to). Symes and Rooney were highlighted by Villa as the being the real threat in the 2001-02 Youth Cup Final and the best attacking duo in youth team football. It should have been to Michael Symes's advantage that he could quietly develop into an exceptional talent, whilst the spotlight rested elsewhere. he should have gone far... but it was not to be. He went out on loan to Crewe but he could not make the grade with David Moyes and, like many before and after, he was released in May 2004 after spending the season in the senior squad. 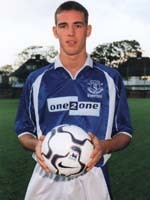 Turns out that he was wracked by injuries and needed six operations in his time at Everton. Another prodigious talent denied us by the vagaries of this cruel (beautiful?) game. He joined Bradford for the 2004-05 season but didn't get many games (injuries again?) and was loaned out to Stockport County in January 2006 but has not even gotten a game with them.